Here we go again; Friday. The most glorious of days, announcing the weekend and the potential that those two days contain. And to deliver the “sprinkles”, welcome to this week’s News, Views and Truths. So after last week’s global market shake-out, most indices have returned to some semblance of normality. The FTSE 100 has creeped over the 7000 barrier and currently stands at 7021, with the US S&P 500 also trading sideways after last week’s sharp falls. However, whether it is to do with a global economic slowdown or the continuation of US tariffs, China is continuing to suffer. Overnight, the Chinese government announced that economic growth had slowed to 6.5%, missing expectations of 6.6% and posting the weakest figures since 2009. I suppose the question is, what does 6.5% annual GDP growth actually mean? First of all, 6.5% is the target set by the Chinese government and as they have met this, that’s all good right? Well, we don’t actually know as the results are always in that ballpark; I’m not saying that the Chinese government manipulate published data but they can manipulate published data. Perspective is always a good thing so let me give you some. The United States is currently enjoying fantastic growth at 3.8%. The UK is at 1.8%, slightly ahead of France at 1.6% but slightly behind the Marshall Islands at 1.9%. Libya is growing the fastest at 55.1%, with Venzuela losing 12% pa. So China is continuing to do what China does – hit 6.5%. Yet there are other problems that the economy is having to deal with which is more to do with the demographic change within the country. The issue at hand is that, since the global credit crisis in 2008, China has grown on the back of huge amounts of debt, both corporate and personal. This has escalated to a situation where large amounts of shares, owned by major investors, are routinely used as a margin in lending to fuel growth and expansion. Again, perspective is a great thing; $640bn shares were pledged for loans as of October 12, based upon data from the China Securities Depository and Clearing Company (CDSC). This uncertainty on the economy has continued the woes of the Shanghai Composite index, with a further sell-off of 2.9%, taking the year to date performance to -23.82% and down 49.37% since June 2015. And in this age of global interconnectivity, it would be naive to think that there is little to no change of any of this contagion spreading west. Irrespective of the current trade situation between the US and China, history does show that if extreme market moves occur in the east, ripple effects do affect the west. 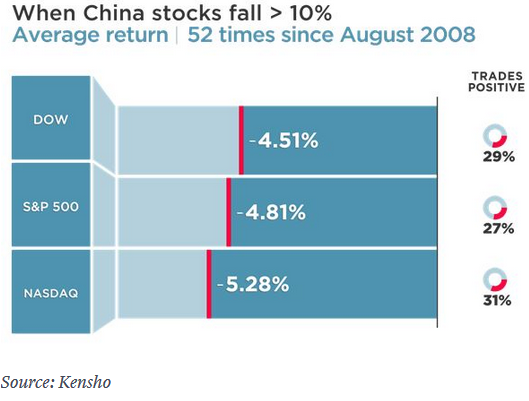 Analysis has shown that when Chinese stocks fall by more than 10% in a 30-day period, all US indices suffer significant declines. The light at the end of the tunnel, however, is that the US-China trade discussions have not escalated as many had feared. If we do see a reconciliation in the short term, investors could experience a significant rebound in values. US Commerce Secretary, Wilbur Ross said that U.S.-China trade talks are on hiatus. Closer to home, debate currently surrounds the future of the £50 note, whether there will be a new polymer note and most importantly, whose face will be on it. As you all know, the current note features steam engine pioneers Matthew Bouton and James Watt, although in today’s modern age, perhaps a more modern approach would be required to reflect the vibrant and dynamic era that we all thrive within. This would be my vote. And on that note…. this week’s playlist. With a nod to today’s subject, I sincerely hope you all have a refreshing weekend and I shall see you all next week.